Every winter, there’s always a chance that one or more snakes will decide it’s hibernation time and that refusing to eat would be an awfully good idea. (This can be triggered by less ambient light and cooler temperatures, even if their cages are heated.) This year, it was the turn of our 8½-year-old male Baird’s Rat Snake, who skipped two successive feedings. Normally, skipping a meal every now and then isn’t a big deal for a snake, even when they only get fed every week or two, so we weren’t overly concerned. Since his cage is in my office, he’s been easy to keep an eye on. 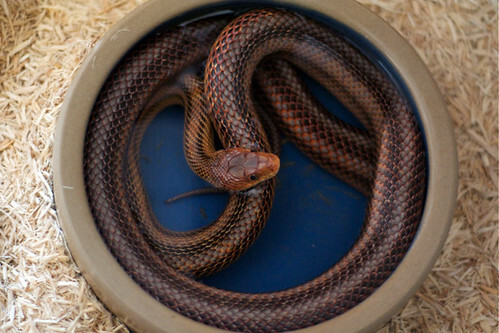 He was probably in hibernation mode, since we often saw him soaking in his water dish (as he was in the above picture, taken on December 15), which is something snakes trying to hibernate tend to do. Anyway, he ate again today, so he really didn’t give us much of a chance to start worrying.